(NaturalNews) Hand sanitizer causes the skin to absorb 100 times more of the hormone-disrupting chemical bisphenol A (BPA), according to a study conducted by researchers from the University of Missouri and published in the journal PLOS ONE. BPA exposure came from handling receipts printed on thermal paper, the kind typically issued by cash registers. "Our research found that large amounts of BPA can be transferred to your hands and then to the food you hold and eat as well as be absorbed through your skin," lead author Frederick vom Saal said. 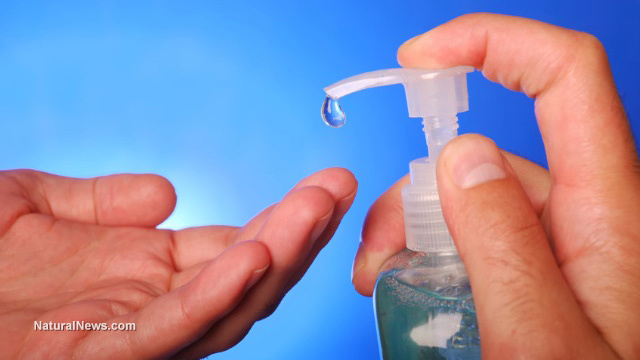 Research had previously shown that hand sanitizers cause the skin to absorb higher levels of chemicals, but this had not previously been demonstrated with BPA. Much attention has focused in recent years on the dangers of BPA, which in addition to receipts is also found in clear, hard plastics and in the linings of food and beverage cans. BPA has also been linked to heart disease and infertility. In the new study, participants were told to handle receipt paper for various lengths of time. Some of the participants used hand sanitizer before handling the paper, and some ate French fries by hand after touching the paper. BPA levels in the participants' blood, skin and urine were measured before and after each intervention. The researchers found that handling receipt paper for 45 seconds caused BPA levels on the skin to rise to 581 µg; 40 percent of this occurred in just the first 2 seconds. After about 4 minutes, skin levels had fallen by 27 percent, probably as the chemical was absorbed into the body. Ninety minutes after handling receipts, the average participant had blood and urine levels of 20 mg BPA/g creatinine, levels that have been previously associated with increased risk of heart disease and type 2 diabetes. The levels seen are also considered high enough to increase the risk of developmental abnormalities in children. Participants who had previously used hand sanitizer had blood and urine levels 100 times higher than those who had not used the chemicals. BPA levels increased more in women than in men, although the reason for this is unknown. The findings are particularly worrisome for people who handle receipts all day at work, the researchers said. "Store and fast food receipts, airline tickets, ATM receipts and other thermal papers all use massive amounts of BPA on the surface of the paper as a print developer," vom Saal said. "The problem is, we as consumers have hand sanitizers, hand creams, soaps and sunscreens on our hands that drastically alter the absorption rate of the BPA found on these receipts." The researchers noted that people who handle receipts and then eat food actually get exposed to BPA twice: some through the skin, and then some by mouth. Therefore, the researchers recommend not eating immediately after handling thermal receipts. Best of all, they said, would be to avoid BPA altogether. Hand sanitizer has also previously been linked to other health problems, including endocrine disruption, immune dysfunction and cancer. Studies have also shown that it contributes to the evolution of antibiotic-resistant bacteria and creates bacterial imbalance on the skin -- possibly even increasing users' risk of infection.